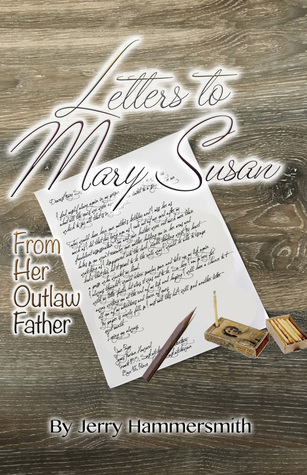 Although this is a work of fiction, if you have any interest in American history, and the mystery surrounding Jesse James, I urge you to read Letters to Mary Susan: From her Outlaw Father by Jerry Hammersmith. The story line comes from a story told to the author, by his father. It’s nice when the author’s father ‘appears’ in the book! The author points out that this is a work of fiction, but it certainly leaves you wondering. It has an interesting concept, as it is told in letters from the main character, and his flashbacks through his long life. The majority of the book is set in a prison. A rather stark prison in the 1920’s. It’s not a prison novel but rather the recollections of his life, by one of the prisoners. The story comes about as he is advised, by the chaplain, to write to his long lost daughter. She grows to know her father, who was presumed dead, through his letters. The main character is Jim Howard, who started life as Jesse James, and who spent most of his life as an outlaw. The book begins with him in prison at the age of 77. I certainly didn’t wish to feel sympathy for the character. I mean, outlaws are the bad guys. Aren’t they? It is not possible though not to feel a tinge of pity. Especially at the thought of somebody so old, in those conditions. Jim doesn’t come across as a bad guy so you feel more and more sympathetic as his story progresses. This is illustrated by the fact that he was held in high esteem by others, throughout the various phases of his life. He didn’t always make the best choices, but many of the things that led to him originally becoming an outlaw, were out of his control. Stealing is like a high, which is one of the main reasons he couldn’t stop. This adds to the sadness as he could have had a good life, if he had stopped robbing people. The chapters deal with his life, and wrong doings, in chronological order through his 3 incarnations; Jesse James, John Allen and Jim Howard. They deal with his life, and what he had to do to survive it, through being an outlaw, cowboy and farmer. He doesn’t try to present himself in a good light, he just tells it like it is, so his daughter can get to know him, and understand his actions. There are some portions of the book that are a little repetitive. Some scenes are described several times. Also the swapping of first name and surname are a bit confusing. Especially as this is a character who has 3 different names already! There are some sentences where he is referred to as both Jim and Howard which takes some working out. But these are small annoyances and don’t detract from a good read. I thoroughly enjoyed this book. It is a great, interesting, and poignant read.